Gold backed Exchange Traded Funds (ETFs) are securities designed accurately to track the price. BullionVault simply allows private individuals to buy gold bullion and own it directly as personal property - storing it in one or more of their choice of high security accredited vaults situated around the world. Both have been very successful at increasing gold bullion investment. This web-page compares and contrasts the two services to help the reader make an informed choice regarding investment. Sort tables by clicking column headings. The gold bullion market became very inaccessible to private investors during the 20 year slide in the gold price from 1980 ($850 an ounce) to 2001 ($260 an ounce). The investment market in gold bullion dried up, and the professional spot bullion market shrank in on itself, becoming a closed shop for die-hard gold dealers and traders. Most of the marketplace's ultimate customers were gold jewellery manufacturers. A fundamental constraint was keeping new gold bullion investment buyers out, and this was the form of the professionally traded commodity - the gold bullion Good Delivery Bar. At 400 oz each these bars are large. They are produced by accredited manufacturers and must be kept continuously in accredited storage vaults to retain their integrity. Professional buyers don't accept any other bars as adequate delivery, by a seller, of a spot gold market trade. Unfortunately the accredited vaults operate very secure and cautious businesses, and they had become inaccessible both to investing institutions and - particularly - to private buyers. Both were blocked out of the most competitive international gold bullion market in the world. For a while this forced many would-be-gold-buyers into the parallel market for small bars and Coins. But that market was much less liquid than the professional market, and applied very much higher dealing costs. This created a vicious circle of decline. Smaller volumes led to a tougher environment for retail gold dealers, which led to still higher dealing costs. Dealing gold bullion for investment became a very low volume business, and small bar trading costs escalated to 6% or more. Meanwhile the professional market continued to trade between its own members at considerably higher volume and with trading costs well below 1%. Eventually the gold price turned, in 2001. This encouraged attempts by innovative businesses to find a way to make professional market gold accessible to a new generation of gold bullion investors. Digital Gold Currency was an early attempt, but now, by far the two most successful approaches are Gold ETFs and BullionVault. Gold ETFs have been around since about 2003. They started in Australia, and are now available widely. They were targeted originally at investment institutions. BullionVault has been around since early 2005. BullionVault was designed primarily for private individuals. Is it Gold you're Buying? BullionVault : You are buying physical gold in Good Delivery Bar form already stored in a specific accredited gold bullion vault in the location you chose. Gold ETFs : You are buying a quoted, gold denominated, debt security which is the obligation of a trust created for the specific purpose of enabling gold investment through it. The trust deed requires the gold denominated debt of the trust to be backed by gold assets which the trust must own - although possibly in various forms. Most of the gold owned by the trust will be in the form of allocated, vaulted Good Delivery Bars. Some gold assets may temporarily be in forms other than Good Delivery Bars, but where in other forms are likely to be converted into physical allocated good delivery bars in due course. In both cases the bars retain their Good Delivery status, and thus their marketability in professional bullion markets. In both cases you have the right to withdraw - for a fee - but in both cases the services should be used where you do not expect to withdraw gold except in emergency. This is because it is highly likely that when you withdraw bullion it will lose a substantial proportion of its value with the loss of its Good Delivery status. Gold ETFs : You are buying nominal one-tenth-of-a-troy-ounce gold units, with a weight discount applied. The gold weight backing each unit steadily declines - through the daily extraction of the management charge; usually equivalent to 0.4% per annum. For example, as at 9th Jan 2015 the backing on an ETF Securities GBS gold security is down to 95.74% of one tenth of a troy ounce. It is important to understand that a dealing price below the nominal one-tenth-of-an-ounce is not a discount to asset value but almost always reflects the reduced gold backing of an ETF unit. You can monitor the reducing backing of ETF Securities GBS on their website. BullionVault : BullionVault charges commissions of 0.5% up to $75,000, then 0.1% for the next $750,000, then 0.05%. Whether you deal in US Dollars, British Pounds, Euros or Japanese Yen, the commission bands apply to an equivalent value. Gold ETFs : ETF dealing charges vary according to the stockbroker you choose, and may be subject to exchange fees. Some ETFs can be traded on low fixed-price commissions at discount brokers. Usually these deals are available only for small-order automated execution systems, which tend to have wider spreads than are available on the professional dealing platforms. BullionVault : BullionVault posts live dealing prices on public internet pages 24/7. You can see BullionVault's live prices at any time here. Gold ETF : Generally stock exchanges do not allow open access to current prices. They usually permit free access to 20 minute delayed prices, and reserve current pricing to member firms and their customers at the point of dealing, during the host stock exchange's dealing hours. You can see 20 minute delayed prices for GBS on their internet page. BullionVault : The average spread across all users is exactly 0. When you deal you choose whether to post limit prices (earn the spread) or accept other peoples' posted prices (pay the spread - usually about 0.25%). Gold ETF : The spreads are tight on professional dealing platforms - frequently as low as 0.15%. BullionVault : Allows trading directly in US Dollars, British Pounds, Euros or Japanese Yen. Users of these currencies incur no currency conversion costs as they deal directly with counterparties trading gold in the same currency. Gold ETF : Dealing in currencies other than US$ tends to mask a significant cost. Where the price is quoted in $, but the customer settles in another currency, then the broker will convert the currency at the firm's standard rate, which is unlikely to be good for the customer. Brokers frequently charge 3% or more in currency transaction spreads. This significant cost of dealing gold ETFs is well disguised in exchanges outside the USA. BullionVault : BullionVault allows all larger users to trade off-line, and directly on the main gold bullion market. Off-line trading must be during London market hours. There is no limit to the size of trades except the depth of the professional physical bullion markets, and London is the biggest of the world's physical bullion markets. Gold ETF : ETF liquidity is supported by large professional market makers and dealers, in the normal way of providing liquidity on the relevant stock exchange. Additionally there is the facility to create and redeem new units - on demand. BullionVault : The inclusive charge for storage and insurance is 0.12% per annum, subject to a minimum of $4 per month. Gold ETF : The charge for storage is 0.4% per annum. There is no minimum. Because of the minimum charge which BullionVault applies the ETFs are slightly cheaper for storage up to $12,000, but never by more than $4 a month. Above $12,000 BullionVault is always cheaper. Above $40,000 storage and insurance at BullionVault is less than one third of the cost of storage and insurance within an ETF. The BullionVault storage fee includes insurance. The evidence of that insurance is published on the BullionVault site. Gold ETF : ETF gold may or may not be insured, at the discretion of the Custodian. The following is extracted from the prospectus for Lyxor GBS. The Custodian (or one of its affiliates) may make such insurance arrangements from time to time in connection with its custodial obligations with respect to Secured Gold held in allocated form as it considers appropriate. The Custodian has no obligation to insure such gold against loss, theft or damage and the Company does not intend to insure against such risks. In addition, the Trustee is not responsible for ensuring that adequate insurance arrangements have been made, or for insuring the gold held in the Secured Gold Accounts, and shall not be required to make any enquiry regarding such matters. BullionVault : On BullionVault you own gold as your personal property. There is no complex trust deed. Your title is straightforwardly set under simple laws applicable to physical, tangible property - just as you might own any other solid object. Your property right is not diminished by your physical property being in the safekeeping of a custodian. Your right to enjoy this outright private ownership is predicated on powerful property laws drafted and enacted by the government in the jurisdiction in which you own your gold. Gold ETF : Under an ETF a trust owns the gold, and you are a beneficiary of a debt owed by the trust and backed by its gold. The trust deed was drafted by the scheme's managers and their lawyers. The detailed terms of trusts can sometimes be complex but you can always get a copy of the relevant trust and you can examine it yourself, or have it examined by your own lawyers. BullionVault : BullionVault believes there is no permanently secure home for gold. As times change national politics change with them - sometimes quite quickly. That is why BullionVault is set up with separate vaults in five countries: Switzerland, UK ,USA, Canada and Singapore. It is also one of the reasons that BullionVault offers instantaneous settlement of transactions - at the point of dealing. You can choose in which vault your gold is stored, and this results in your gold being held exclusively under that jurisdiction. With instantaneously settled deals you can easily and very quickly switch between locations, in response to changing political or economic circumstances, by selling and instantly re-buying. If you own whole bars then you can also instruct for your gold to be shipped to an alternate vault. Gold ETFs : ETFs generally hold their gold in London in multiple, unspecified bullion vaults. This is because London remains the centre of the international physical bullion market. Your jurisdictional exposure is both to London, as the storage location, and to the state under whose laws the ETF trust deed was drawn up. Therefore a failure of either jurisdiction to protect your property rights would ordinarily affect you. Within an ETF it is not a practical proposition rapidly to move your gold entitlements to a different location and jurisdiction. The process of moving your gold's jurisdiction requires the sale of units, and a wait for the prevailing delays in stock exchange settlement and inter-bank transfers. You would then need to choose a different gold ownership service. BullionVault : Every day BullionVault reconciles the current bar lists. The bar lists - for each of the vault locations and metals traded on BullionVault - evidence the actual bars in each vault, and they are produced independently of BullionVault by the internationally accredited bullion market vault operators it employs. BullionVault publishes on the internet both the bar lists and a listing of all holders' nicknames and their individual holdings. Nicknames are only known to the entitled holder (e.g. you). This proves to each holder their exclusive ownership of a specific quantity of gold, itself proved against third party evidence of the total quantity of gold stored in the vault. The daily internet publication of this reconciliation is independently audited by formal auditors - members of The Institute of Chartered Accountants for England and Wales - and their audit report is published on the auditors' own website, again independently of BullionVault, and again available for public inspection. Anyone can arrange a daily RSS feed of the BullionVault reconciliation direct to their own computer. This can automatically download the entire register, or any section of it, every day. Gold ETFs : Periodically a bar list is produced by the ETF itself and published on the internet. An undertaking is provided that the total number of units in issue matches the bars in the vault. No reconciliation to individual holders is provided. We believe ETFs offer a good service - and a service which is in every way better for gold buyers than futures (which are unbacked by gold bullion and thereby subject their holders to unknown risks of default during a crisis). We also understand that convenience, where the buyer has an existing brokerage account, may make ETFs an excellent choice for many investors. Perhaps they are most appropriate to investment institutions - for who they were originally targeted - because so many funds are required to own instruments which are structured as securities and traded on a formal stock exchange. 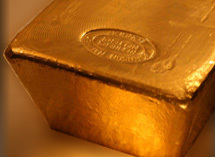 For critical information about buying gold bullion safely, and at the best prices, click here.